Anti-Kiev hacking group CyberBerkut has released legal documents allegedly obtained from the office of Ukrainian far-right politician and warlord Dmitry Yarosh, which it claims implicate him in a host of economic crimes. “We are publishing documents that expose the criminal activities of the head of Ukrainian neo-Nazis, which confirm multiple incidences of extortion – the illegal and cynical seizure of properties and businesses belonging to Ukrainian citizens by Yarosh and his associates. The stolen money is then taken out of the country through fronts and deposited in offshore accounts,” reads an unsigned document that accompanies a series of document scans on the CyberBerkut website. As well as posting a supposed scan of Yarosh’s passport and other private documents, as proof of their break-in, the hackers have uploaded several contracts for the purchase and lease of property, which they say were signed under coercion. They also posted three compressed files of other scans. None explicitly feature Dmitry Yarosh’s name, but one of the companies in question belongs to Sergey Yarosh – though the connection between the two men is unclear. 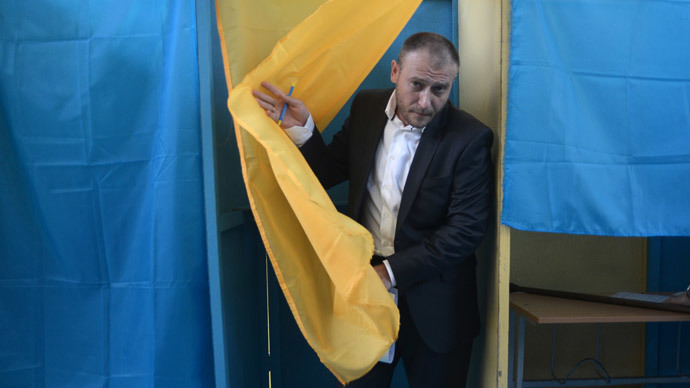 Yarosh, who is wanted by Interpol on charges of inciting terrorism, was elected to parliament in October 2014. He played a key role in the protests on Maidan (Kiev's Independence Square) that resulted in the toppling of Viktor Yanukovich’s government earlier that year. CyberBerkut is named after Berkut, the government special force unit deployed to restrain the protesters. Operating under the motto “We won’t forgive! We won’t forget!,” the online group has targeted high-profile figures in the new government. As well as posting the private documents and conversations of top politicians, including Yulia Tymoshenko, it has shut down high-profile websites – including those belonging to NATO – with distributed denial of service (DDOS) attacks. If confirmed, the latest allegations will fall in line with the high level of corruption inside the country’s ruling class. In December 2014, Transparency International named Ukraine the most corrupt country in Europe, coming in 142nd out of 175 countries in the worldwide ranking. This is a title it retained from the previous year – despite the new Ukrainian leadership staking their reputation on cleansing out what President Petro Poroshenko, himself the subject of several lengthy financial scandals in his role as the 'Chocolate King,' has called the “paralyzing” corruption of the Yanukovich era. Last October, the Rada approved sweeping anti-corruption legislation at the behest of the IMF, which is helping the government stave off a financial collapse. As part of the reforms, two agencies were supposed to be set up – an independent body to investigate officials, and another to monitor state expenses. Neither has begun functioning, and neither is expected to become fully operational until next year. “Right now I see much more conversation about what needs to be reformed and less in terms of actual achievement. It has to do with reforming the country, really changing it, not just passing laws,” Francis Malige at the European Bank for Reconstruction and Development – which is funding some of the reforms – told Bloomberg this week. One of the key failures has been the lack of effective action against the figureheads of the previous regime, at whom the original protests in Maidan were aimed. While many of them – such as energy minister Eduard Stavytsky and natural resources minister Nikolay Zlochevsky – fled the country following the events of February 2014, much of their property was never seized by the state, and has been re-sold since, meaning that the money might have found its way to its original owner. With murky corporate structures, it is possible that swathes of Ukraine’s industry are still being run by its long list of fugitive politicians – and the parts that aren’t are still owned by oligarchs and politicians, who are almost universally tainted with the country’s legacy of decades-long economic misrule. Ukraine's campaign against its eastern regions has also been hampered by pervasive corruption in the army. Local media stories have circulated of volunteers being rejected so that corrupt recruitment officials can extort money from draft-dodgers, while expensive equipment has also gone missing. Mid-level officials are currently being replaced – the latest in a series of reforms that have repeatedly failed to produce a transparent military. Unsurprisingly, with the country’s internal conflict unresolved and GDP predicted to shrink by five percent this year, four in five Ukrainians said in a survey last month that they believed the amount of illegal financial activity had either increased or stayed the same since the toppling of the previous government.